Is it possible to recognize the special roles that animals played thousands of years ago? Historic records and oral histories provide abundant evidence for the special roles animals played in American Indian societies. For example, some animals held spiritual or religious significance. Some animals served as symbols of relatedness of people in groups such as kinship groups. In this section, we examine some of the special relationships that Archaic Period people had with animals. We don’t know how well the inhabitants of Modoc and Koster cared for and treated their dogs. Some archaeologists argue that early dogs may have been camp followers and scavengers. Others suggest that they may have played more important roles. We briefly discuss ideas about human use of dogs below. Dog burial at Koster Site, Early Archaic. Burial of domestic dogs suggests Archaic Period people had special relationships with dogs. The dog in this image was buried during the late Early Archaic Period at the Koster site. Image used with permission of the Center for American Archeology. Both Koster and Modoc Rock Shelter have early dog burials. These burials suggest that the relationship between people and their dogs was different than that with other animals. One burial at Koster may include grave offerings, but the association is not definite. We cannot assume that Archaic Period people had the same relationships that people today have with their pampered pets. However, it is difficult to conceive of burying an animal that was not somehow valued and cared about. Dr. Darcy Morey argues that burial of dogs during the Archaic Period reinforces the role of dogs as social companions. Some puppies and dogs likely received affection and special treatment. Other dogs may have survived by scavenging food refuse around the camp. 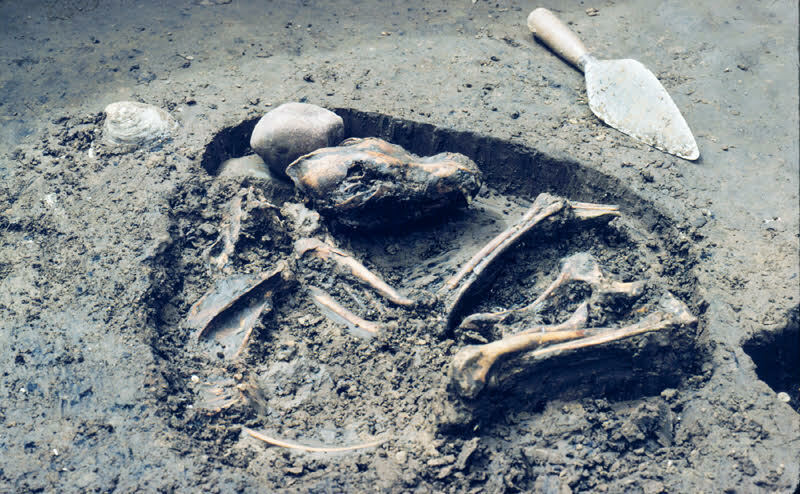 Dog burials occur at numerous Archaic Period sites, and are especially abundant at Middle and Late Archaic Period sites in the Ohio River Drainage, especially the Green River Shell Midden sites in Kentucky. 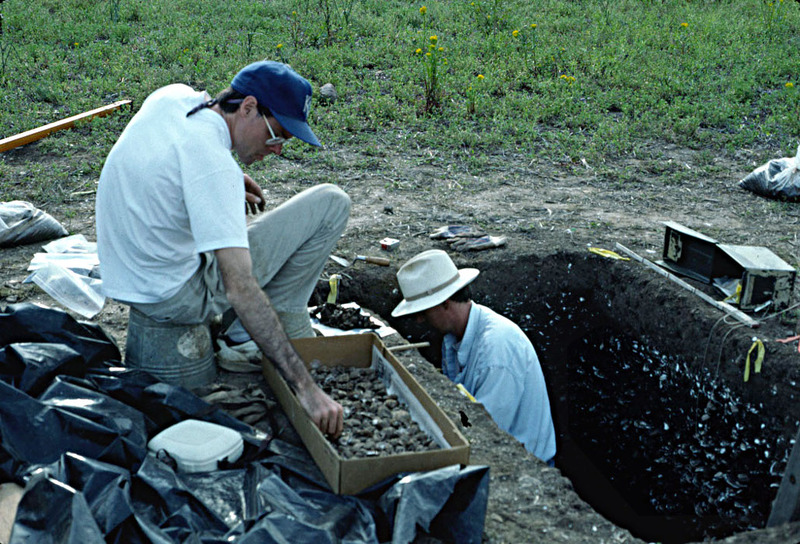 At the Indian Knoll site, a Green River Shell Midden site near the shell midden sites in our study area, some dog burials appeared to be paired with human burials. Historic accounts of many American Indian groups note the positive role that dogs played as sentries. Barking dogs alerted people in the camp that others were approaching. We know that some dogs were not buried in graves. Their bones ended up in the refuse middens and sometimes show cut marks and burning. Archaic Period Indians may have eaten some dogs, perhaps during times when wild foods were scarce or for special occasions. Historic records provide numerous descriptions of eating dog meat. Sometimes dog meat was served for special occasions or ceremonies. We don’t know the antiquity of some of these cultural practices. Dogs may have played an important role in Archaic Period hunting. 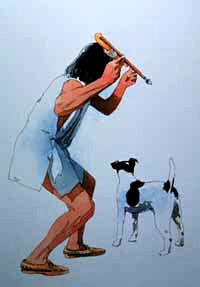 This Andy Buttram illustration for Dickson Mounds Museum shows an Archaic Period hunter with a small dog. The size of the dog is based on studies of dog skeletons from Archaic Period sites in Illinois. Archaic Period people may have used dogs as hunting aids. Dr. Angela Perri argues that dog burials provide evidence that dogs were important to hunting in Early Holocene forest environments. Dogs may have helped drive animals, locate prey and wounded animals, and perhaps to retrieve fallen prey. Many archaeologists think that dogs served at least some of these purposes during the Archaic Period. Ethnographic and historic accounts show that American Indian tribes used dogs in these ways. We don't currently know if Archaic Period dogs served as beasts of burden. Some archaeologists think they may have carried small packs or pulled a travois. The physical evidence for such use is inconclusive. Image of a historic American Indian travois taken from the United States Department of Agriculture, Forest Service, Helena National Forest website (Public Domain). Dr. Darcy Morey summarized evidence for dogs serving as beasts of burden among historic American Indian tribes (see References). For example, the Assiniboine used dogs to carry packs. 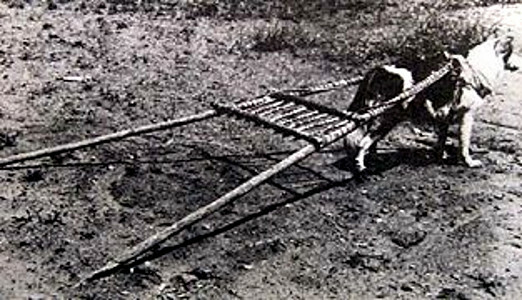 Numerous historic Plains Indian tribes used a dog-pulled travois. A travois consisted of two poles that were crossed or brought close together at one end. They held a framework to carry a load and could be dragged by people or dogs, and much later by horses. There were no horses in the Archaic Period. They were introduced by the Spanish in historic times. Dr. Morey also summarized archaeological evidence for dogs as beasts of burden. For example, zoarchaeologist Lynn Snyder studied dogs from Plains Indian late prehistoric and historic archaeological sites. Her study documented pathologies of vertebra and shoulder joints. She attributed these pathologies to pulling travois. Zooarchaeologist Diane Warren studied Archaic Period and later dogs from the Southeast and Woodland Period dogs from the Illinois area. She described anomalies in vertebra and fractures in vertebral spines. She argued that these anomalies and fractures suggest that dogs in the Southeast and Midwest carried loads in packs. Dr. Morey concludes that the causes of the pathologies are not definite because they also show up wild and domestic canids that never served as beasts of burden. Drs. Lawler and Widga examined vertebra and shoulder joints of Archaic Period dogs from Koster and Modoc to see if there were skeletal indications of service as pack animals. However, similar to Dr. Morey, they did not find pathologies in bones that could only be linked to service as pack animals. Future studies of dog skeletons may provide more clues to how Archaic Period people used the dogs at sites such as Modoc and Koster. Some objects made from animal parts may have been important to beliefs and ceremonies. For example, bone flutes or whistles and turtle shell rattles from Archaic Period sites once filled the air with music and may have been used in special ceremonies. Archaeologist Dr. Howard Winters reported bone flutes or whistles and turtle shell rattles from the Riverton site in our study area. Archaic Period Indians made bone flutes by cutting holes in bone tubes made from the long bones of large birds. They drilled turtle carapaces (upper shell) and plastrons (lower shell) so they could lash them together to make rattles. They filled the rattles with small pebbles. These types of artifacts are recovered at Archaic Period sites. 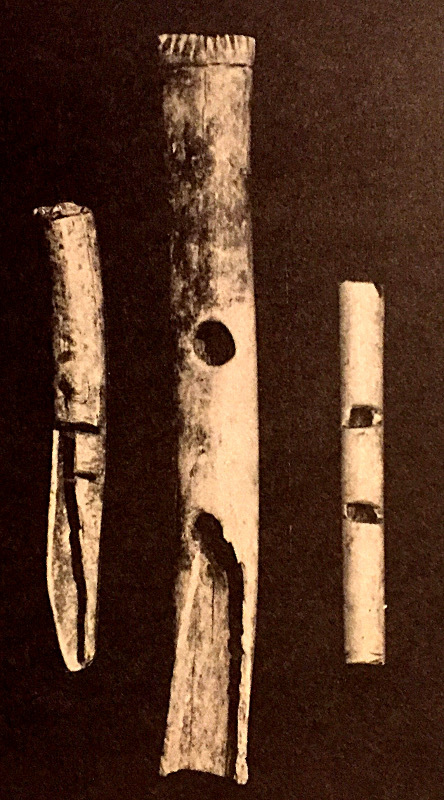 Archaeologists documented these three Late Archaic bone flutes or whistles that are in private collections from the Riverton site (left image above). Archaeologists also excavated smaller fragments of flutes or whistles from the Riverton, Robeson Hills, and Swan Island sites. 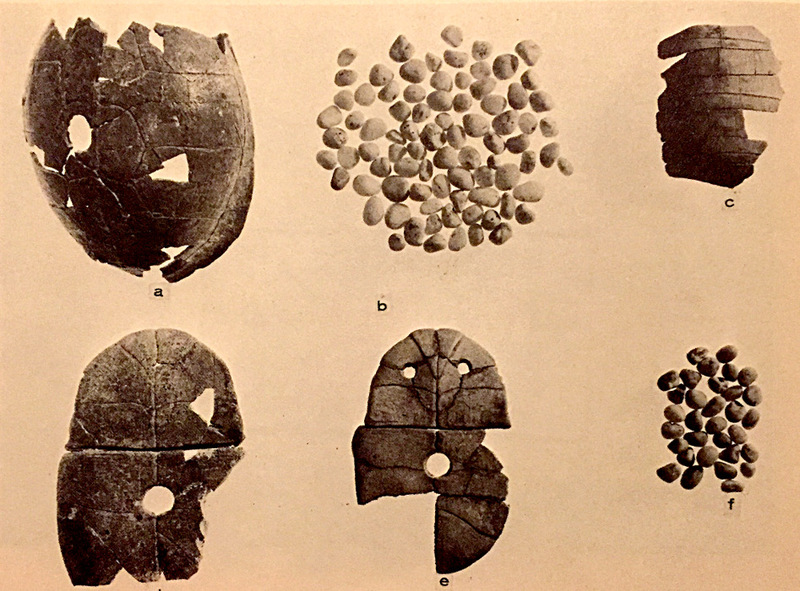 The turtle shell rattles represented by a carapace (a), pebbles (b), and a plastron (d) are from Late Archaic Period Riverton Culture contexts (right image above). The other turtle shell rattle (c, e, f) in the right image is from a late prehistoric (Mississippian Period) site in Fulton County, Illinois. Use of rattles has a long history. Images are taken from Howard D. Winters, 1969, The Riverton Culture, Illinois State Museum Report of Investigations, No. 13. Most of the bones in the Modoc West Shelter cache are attributed to Canada Goose (upper image, taken from Wikimedia Commons). Most of the goose radii were whole and unmodified. A few of these unmodified radii are shown here (lower image, taken by Doug Carr). Click on the image to see Dr. Parmalees's writing on some of the bones. Archaic Period people sometimes placed bones in special contexts. These contexts suggest that the bones and perhaps the animals had special importance. In 1956, archaeologists excavated a large accumulation (a cache) dominated by goose radii (wing bones) in the Modoc West Shelter. Dr. Paul Parmalee has noted that the cache included 160 radii primarily from Canada Goose (Branta canadensis), but with a few Snow Geese (Chen sp.) represented. He also noted that most of the goose radii were whole and unmodified. Only a few had been modified. The cache has never been fully reported. Bonnie Styles and Mona Colburn recently examined it. The cache is from the middle Middle Archaic Period. Based on preliminary counts, about 15 goose radii had been modified. They were cut straight across on one end and ground to a point on the other end. The Minimum Number of Individual geese represented in the cache has not yet been calculated, but as many as 80 individual geese may be represented. The large tarsometatarsi are attributed to Sandhill Crane (upper image, taken from Wikimedia Commons). These large bones are not modified (lower image, taken by Doug Carr). The presence of some Sandhill Crane foot phalanges and ossified tendons in the cache suggests that perhaps the lower leg and foot was present. The cache included six whole Sandhill Crane (Grus canadensis) tarsometatarsi. These bones did not show clear signs of modification. The cache also included large numbers of a few other bird elements: 34 first phalanges from the second digit in the wing (most likely from geese), over 58 second phalanges from the second digit in the wing (most likely from geese), and about 49 phalanges from the foot of large birds (some are definitely from Sandhill Crane). There are also other bird elements including a few carpometacarpi, tarsometatarsi (likely from goose), tarsals, and distal foot phalanges (claws). There are fragments from ossified tendons, which resemble those of the Sandhill Crane in our comparative collection. None of these elements were previously mentioned in descriptions of the cache. If the distal parts of intact goose wings were present in the cache then we would expect to find ulnae and more carpometacarpi. These bones are not present. The presence of foot phalanges and ossified tendons from Sandhill Crane suggests that the lower parts of the leg and foot may have been present in the cache. What does this large accumulation of bird bones represent? Perhaps the radii represent a toolmaker’s cache of raw materials to be used to make the special pointed implements. 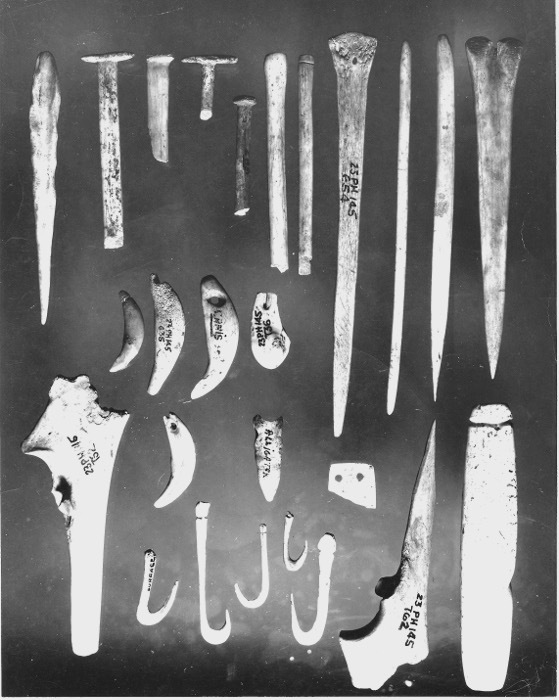 Maybe the cache was for an individual who used these pointed implements for some unknown but important purpose. As will be discussed below, perhaps the cache was ritual in nature and was part of a fertility shrine. The large accumulation of the whole radii from a single species is unusual and suggests a special significance. The recovery of even the six whole bones from the Sandhill Crane is also unusual. The presence of additional wing elements and additional leg and foot elements adds to the mystery. This is when you wish you could have seen the original context during the excavation of these remains. Were the other goose wing elements near the radii or were they grouped together? Our next task will be to see if we can locate any photographs of the cache during its excavation in 1956. The middle Middle Archaic inhabitants of the West and Main Shelters at Modoc hunted birds associated with aquatic habitat, but Canada Goose and Sandhill Crane were not abundant among the food refuse. Were Canada Goose and Sandhill Crane of some special importance to the middle Middle Archaic inhabitants of Modoc Rock Shelter? Were the tools to be made from their bones for use in special activities? Is the cache part of a ritual offering? We are exploring these possibilities and looking for evidence of similar occurrences at other sites in our study area and beyond. Archaeologists excavated a cache of goose bones in Paleo-Indian deposits at the Dust Cave site in northern Alabama in our Mid-South subarea. Image provded by Renee Walker. Dr. Renee Walker on our research team reported a cache of 23 Canada Goose and Giant Canada Goose (Branta canadensis and Branta canadensis maxima) humeri (wing bones) from Dust Cave in Northwest Alabama. At least 12 individuals are represented. Nineteen of the bones had cut marks related to removal of the bone or flesh on the bone. The cache dated to the late Paleo-Indian Period so was earlier than the cache at Modoc Rock Shelter. Goose bones are reported for all levels at Dust Cave, but are not particularly abundant. Drs. Walker and Paul Parmalee conclude that the inhabitants of Dust cave had a “specialized intended purpose” for the goose bones. The Dust Cave goose wing bone cache may the earliest evidence for a cache of bones for tool manufacture or some unknown ritual or other purpose in the Midwestern or Southeastern United States. Dr. Parmalee and others have documented the wide variety of tools and other objects that later American Indian peoples made from the wing bones of large birds. For example, they were made into fans (with feathers left in place), tubes, pointed implements, whistles, and other objects. Shell Midden or Shell Construction? Drs. George Crothers and Tanya Peres of our research team consider the Green River mussel shell middens in Kentucky and the Cumberland River aquatic gastropod middens of Tennessee as concentrated refuse reflecting heavy human usage of the animals for food. Dr. Cheryl Claassen questions the assumption that shell middens are just piles of refuse. She proposes that freshwater mussel shell middens represent intentional constructions for social or spiritual purposes. The freshwater mussel shells at Koster and Modoc, similar to the bones at these sites, are widely dispersed in sheet midden and feature deposits. However, the freshwater mussel shells in the Green River Shell Middens are more concentrated in linear piles. Cheryl Claassen has argued that Green River Shell Midden sites such as Carlston Annis in our study area represent fertility and abundance shrines. The Haynes site is one of the Green River Shell Midden sites in Butler County, Kentucky. Dr. George Crothers on our research team excavated and studied the faunal remains from this site. Excavations were in progress on the slight ridge associated with the Haynes site shell midden (first image above). Archaeologists Darcy Morey and George Crothers collected freshwater mussels shells from a control column at the Haynes site (second image above). The profiles of Test Unit A1 show the large number of freshwater mussels shells present at the Haynes site (third image above). Images taken by Charles Swedland in 1995 and provided by George Crothers. 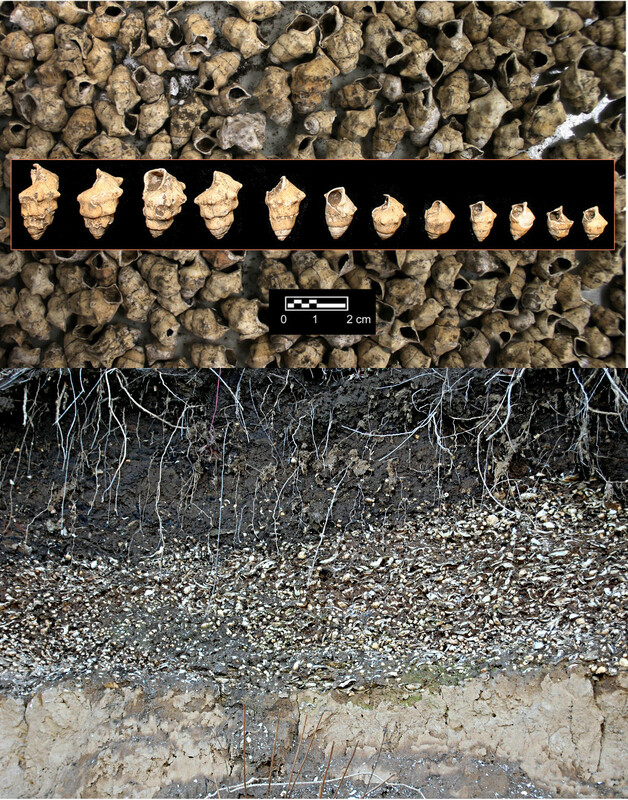 The upper image shows freshwater gastropod shells from a Middle Archaic site along the Cumberland River in Tennessee. The lower images shows a gastropod-dominated midden at a shell-bearing site along the Cumberland River in Tennessee. Images provided by Tanya Peres. Freshwater gastropod shells dominate the midden deposits at Middle Archaic Period sites in the Cumberland Drainage in our study area. Did Archaic Period people intentionally pile these shells to socially mark the locations of their camps? Were these shells intentionally piled to create fertility and abundance shrines to thank the spirits for the animals? Or is the abundance of these shells merely the result of reliance on the gastropods as a major source of food? Our colleagues are exploring these and other possibilities. The Tick Creek Cave site in central Missouri contained large quantities of animal remains. Ralph Roberts, an avocational archaeologist excavated the site in 1961 and 1962. Dr. Paul Parmalee analyzed the faunal remains. Image taken by Ralph Roberts and provided by R. Bruce McMillan, University of Missouri, Museum of Anthropology. In 2016, Cheryl Claassen argued "that an abundance of points, flakes, bones, shells, and bodies is considered sufficient to raise the hypothesis that these offerings and their places constitute a type of fertility shrine." We have included the citation for this article in the references at the end of this section. As noted above, she argues that the Green River Shell Middens of Kentucky are fertility shrines. She also reinterprets faunal remains from Tick Creek Cave in the Gasconade Drainage of central Missouri as a shrine. This Ozark Highland site yielded about 40,500 bones associated with Archaic and younger Woodland Period occupations. Tick Creek Cave is located about 32 km northeast of the Little Freeman Cave site in our study area. Tick Creek Cave makes an interesting case study because the remains were excavated and studied long ago, but researchers keep coming up with new ideas to test. Avocational archaeologist Ralph Roberts and others excavated the site in the 1961 and 1962. 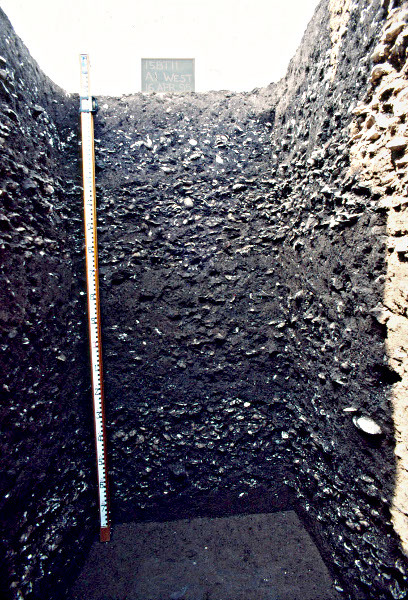 They excavated 5 foot squares in 6 inch levels. The cave entrance faces south and is 60 feet wide and 7 feet high. 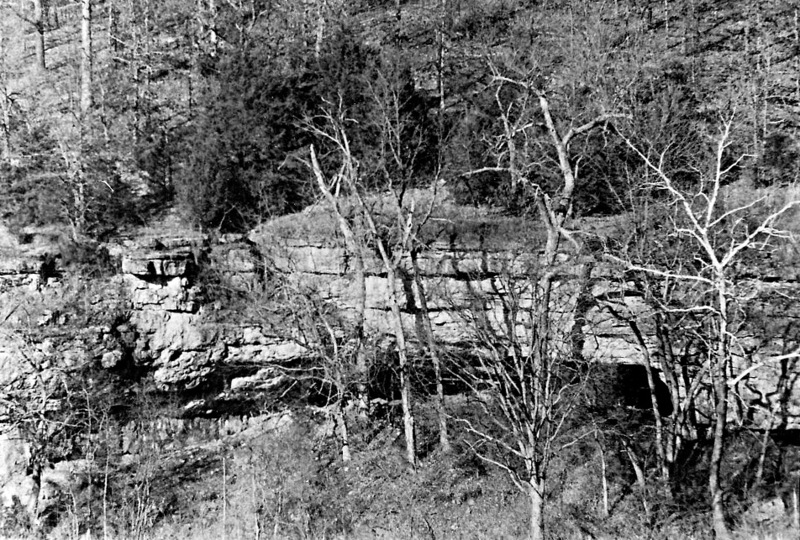 The cave extends about 80 feet into the bluff. Excavations took place in four areas of the cave. Area 1 included the slope in front of the cave to the dripline at the entrance of the cave. Area 2 included the first interior part of the cave. Area 3 included the second interior part of the cave that included rock fall. Area 4 was along the rear wall of the cave. Roberts noted that a large amount of bone was scattered in the interior of the cave and that the heaviest concentration was along the west and rear walls of the cave. Less faunal materials was present in the first interior area, on the slope, and at the dripline of the cave in what he called "the living area." He considered the concentrated layer of bones to be "kitchen refuse." 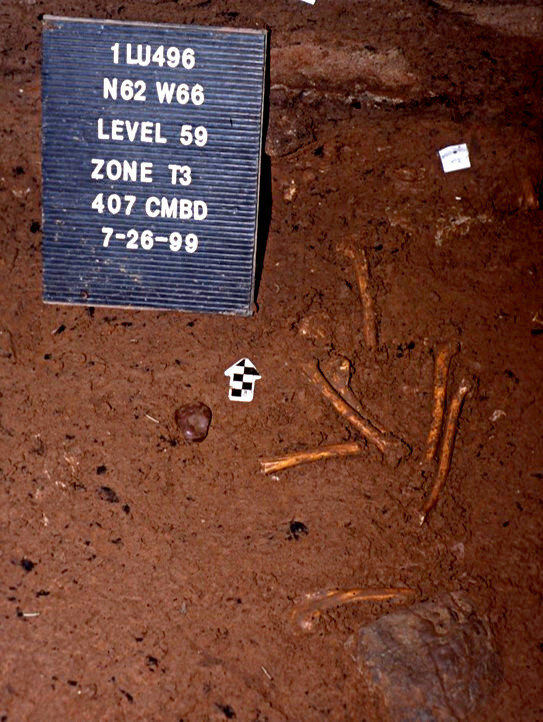 This image of bone artifacts from Tick Creek Cave includes a mixture of Archaic Period and Woodland Period artifacts. However, the crutch-top pins in the upper left area of the image are clearly late Middle Archaic. These same kinds of pins are recovered at late Middle Archaic habitation sites in other parts of Kentucky and in Illinois. Image taken by Ralph Roberts and provided by R. Bruce McMillan, University of Missouri, Museum of Anthropology. 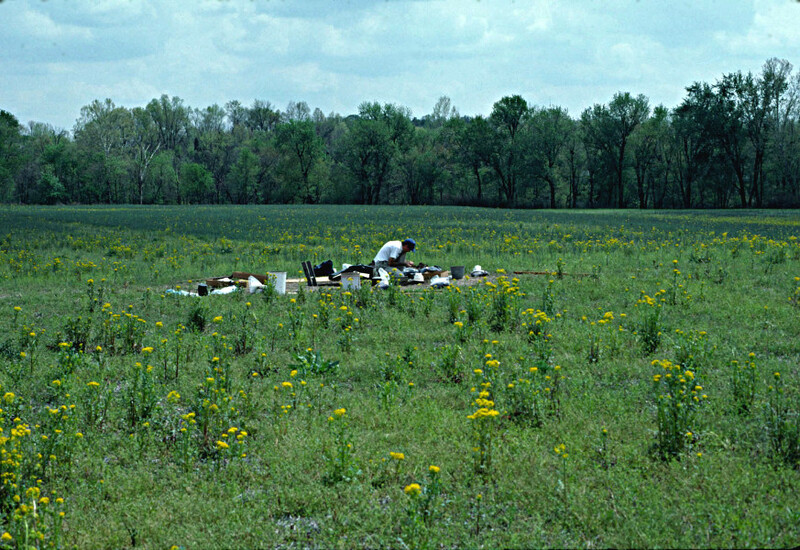 Dr. Paul Parmalee analyzed the fauna from this site in the 1963. He divided the bones into Archaic Period and later Woodland Period assemblages. He reported that most of the bones were from forest animals such as white-tailed deer, turkey, raccoon, striped skunk, and tree squirrels. He noted that percentages of animals were similar between the Archaic and Woodland assemblages. However, because the excavators did not have the experience to recognize disturbances, there was considerable mixing of Archaic and Woodland materials. In 1963, R. Bruce McMillan reanalyzed the data for two test units as a part of his Masters Thesis at the University of Missouri. Columbia. He plotted the faunal remains and chipped stone artifacts by level and had interesting results. Based on the artifacts, he was able to divide the fauna into Early Archaic, Middle Archaic, and Late Archaic, and Late Woodland Periods. McMillan determined that most of the fauna was Archaic and not Woodland, contrary to what Parmalee had proposed. McMillan calculated that white-tailed deer contributed about 78% of the bone in the Middle and Late Archaic deposits. He determined that turkey, raccoon, cottontail, and box turtle were also important in the Middle and Late Archaic faunal assemblages. In 2009, Drs. Bonnie Styles and R. Bruce McMillan, incorporated the results of McMillan's 1963 reanalysis of the Tick Creek data into a larger study of human use of fauna in the Archaic Period of the Midwestern United States. They used the faunal data to support the evidence for the opening of the forest and greater abundance and use of deer in the middle Holocene. Although not specifically discussed, they treated the site as a habitation site, considered the bones as food refuse, and did not explore potential ritual significance. In 2016, Cheryl Claassen argued that Tick Creek Cave is a shrine of abundance associated with increase rites and fertility, most likely connected to hunting rites and a hunt god. She was not familiar with McMillan's reanalysis that allowed more precise separation of the bones into specific Archaic and Woodland cultural periods. She asserted that Native peoples placed food, raw materials, and objects at places where they thought spirits resided. She and others have argued that such places include caves, rock shelters, springs, and river banks. Claassen employs archaeologist Ian McNivin's concept of "ritualized middening" to explain the deposition of items in these locations. Did the Archaic Period people living at Tick Creek Cave ritually dispose of bones of deer and other animals in middens along the walls and back of the cave to create shrines for the animals and associated spirits that were important to them in so many ways—for food, raw materials, and spiritual purposes? We don’t know the answer to this question. However, it reinforces a major point of our grant-funded research. The study of human use of animals has the potential to tell us about much more than hunting practices and diet over the 8,000 years of the Archaic Period.